Ski resorts across the lower portion of North America may show signs of spring — bikinis, blue skies, and outdoor barbecues. But in British Columbia, it’s a different story. Ski resorts across the province are still in the throes in winter. Pack your winter gear if you’re headed there for some spring break turns. 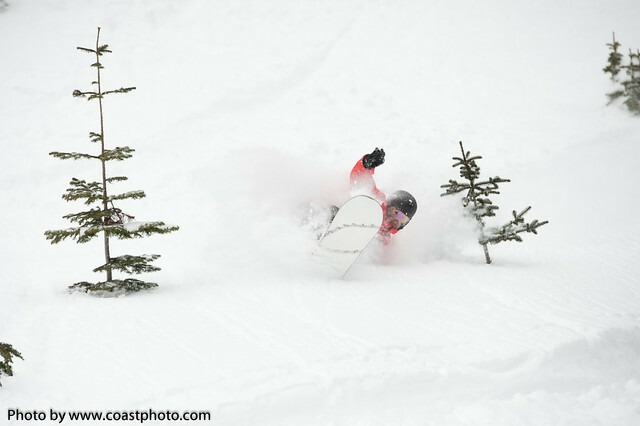 A successive wave of storms has kept the powder skiing fresh at British Columbia ski resorts in March. The down side is that the avalanche danger stayed high, adding three more fatalities — one skier and two snowmobilers — this past week to the already grim year for avalanche deaths. Vacationing skiers and snowboarders on spring break at [R493R, Whistler Blackcomb] wallowed in more powder skiing over the past week with two feet of snow falling in two days. Total snowfall to date at the Pig Alley Weather Station on Whistler Mountain stands just shy of 10 meters or 32 feet of snow. Whistler Blackcomb keeps getting the powder this winter. Photo by Emily Serrell/Coastphoto.com. At [R499R, Whitewater Ski Resort] in Nelson, the first 12 days of March held two 24-hour dumps that hit the 20-centimeter-deep mark, and all but three days recorded new snow. The resort has already topped 850 centimeters (334 inches) for the season. The Columbia Mountains near Revelstoke piled up snow for the Tailgate BC this past weekend. With the snow piling up daily this past week, [R2804R, Revelstoke Mountain Resort] is fast approaching two milestones — a base of 300 centimeters (118 inches) and 10 meters (393 inches) of snowfall to date. At the snow plot at [R146R, Fernie Alpine Resort], the stats are reading well too. The snow pack has reached a depth of 332 centimeters (131 inches) with total snow accumulation of more than 28 feet of snow. What’s in the forecast for many of the BC ski resorts? More snow. Plan on those powder turns. Check out the new snowfall for BC resorts here.